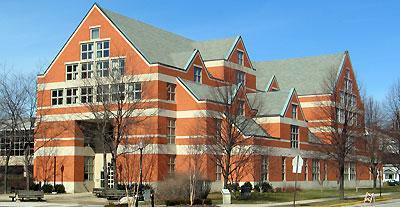 The Van Wylen Library at Hope College has received a 2011 Citation of Excellence from the Library of Michigan Foundation. The award was presented on Thursday, Oct. 27, during the State Librarian's Luncheon of the annual conference of the Michigan Library Association, held in Kalamazoo. The citation honors excellence in customer service, recognition that Van Wylen Library director Kelly Jacobsma noted is especially meaningful. "I am grateful to the Library of Michigan Foundation for honoring the contributions and exceptional customer service that the staff of the Van Wylen Library provided our community this past year," said Jacobsma, who is the Genevra Thome Begg Director of Libraries and an associate professor at Hope. "We have talked a lot about how exceptional customer service in an academic library means strong support for student learning and student academic engagement," she said. "Our staff has been very active in supporting diversity, student learning and scholarship, technology, faculty scholarship and creative performance and connecting widely with the community." Among other initiatives in the past year, the staff taught 238 course-integrated education research sessions and held 298 individual research appointments with students. Work with faculty and programs across campus ranged from developing a resource guide for the college's annual Critical Issues Symposium, titled "Exploring Islam," to working with the college's department of education on its new health curriculum, to supporting the research efforts of the students in the college's interdisciplinary Mellon Scholars Program in the Arts and Humanities. Also in the past year the library helped develop a campus-wide Open Access Policy regarding faculty scholarship; collaborated on a new "Writing Corner," a tutoring and support center; and implemented a new more user-friendly online catalog interface. In March, the library will be one of only 40 sites nationwide - and the only one in Michigan - to host the traveling exhibition "Manifold Greatness: The Creation and Afterlife of the King James Bible." Opened in January 1988, the Van Wylen Library has 23 full- and part-time staff, who during the school year are assisted by approximately 100 part-time student employees. The library provides 24/7 access to thousands of digital scholarly resources including electronic journals, books, reference works, images, music and databases in addition to housing more than 374,000 volumes at the main library and the Nykerk Hall of Music library. In 1989, the library received an Award of Excellence for Library Architecture from the 1989 Library Buildings Award Jury of the American Institute of Architects. In 2004, the Van Wylen Library was named the national winner in the college category of the "Excellence in Academic Libraries Award" presented by the Association of College and Research Libraries. The Library of Michigan Foundation raises funds to support special programs, services and collections of the Library of Michigan. The foundation recognizes a total of three libraries each year through its awards program, one with a State Librarian's Excellence Award and two with Citations of Excellence.